Most Long Beach Island residents consider seaweed a nuisance. It rots as it lays on our beaches and meadows, smells, breeds flies, and discolors boats. It gets between your toes when you swim in the bay. During the summer, Island municipalities have to continually remove it from our bay bathing areas. However, for thirty years after the turn of the century, seaweed was the basis of an important Island industry. 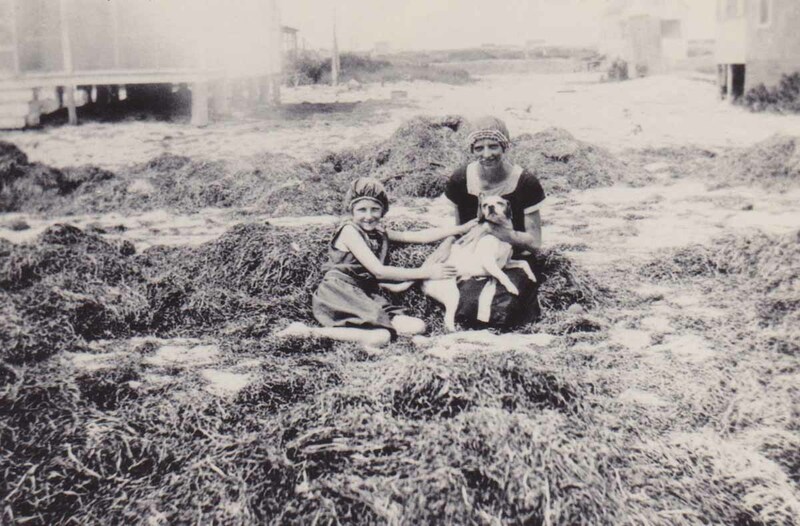 The J.B. Kinsey Seamoss Company, headquartered in Harvey Cedars, gathered eelgrass from the north end and maintained its chief gathering land at High Point — now Harvey Cedars — on the land surrounding what is now Kinsey Cove. The main warehouse, stable and presses were located at the site of the present High Point Firehouse on 80th Street. Kinsey, mayor of High Point in the 1920s, was my great-uncle. My father, Reynold Thomas, mayor of Harvey Cedars from 1955 until 1983, spent summers with his uncle when he was a child. My father was twelve years old when he got his first job with his uncle’s company. He felt very important when allowed to operate a sneakbox with a one-and-a-half horsepower Barker engine that moved just a little faster than he could row. He went to various seamoss stations along the bay delivering hundred-pound rolls of baling wire and shipping tags to the men who baled the grass. There were about seven gathering stations between Brant Beach and Loveladies. After my father returned home from World War I, he joined the company. The Kinsey Seamoss Company sold its product as an inexpensive mattress stuffing to prisons and steamship lines. It was in demand for cheap upholstery, including the seats of Model-T Fords, and for insulating buildings. Back in the early 1970s, when a fire damaged the building on 78th Street that is now Black-Eyed Susans – built in 1917 as Kinsey’s General Store – workmen found insulating seaweed stuffed between the studs. Clusters of storage barns for the seaweed and stables for the horses stood all along the undeveloped bay shore of the island. (Neptune Liquor Store was originally a horse barn.) In front of each group of these buildings were railway sidings where the processed seaweed was loaded into boxcars and shipped out to various markets. The United Fruit Company, which bought seaweed for packing and shipping bananas, is listed in the old Kinsey account books. Another customer was the Victor Talking Machine Company, which used it for hand-finishing wooden cabinets. But seaweed began mysteriously disappearing from Barnegat Bay in the late 1920s, and the Kinsey Seamoss Company pressed its last bale in 1929. In the early 1900s, there was hardly a family in this area that did not have some connection with the seaweed business. It ranked second to fishing as a means of livelihood. I found names in the old company books like Harry Cox of Ship Bottom, John and Crowell Inman of Surf City, Bill Chadwick and George Birdsall of Barnegat. Bill Shinn operated a seaweed business of his own in Brant Beach. Tom Shinn of Manahawkin and his wife Rachel used to manage the shanties where the seaweed gang lived. In the 1960s, Mrs. Shinn’s son Tom, who owned the funeral home in Manahawkin, remembered when Kinsey Seamoss was used for lining coffins. The seaweed gang was largely from the mainland and lived on the Island six days a week during the season. Before the causeway was built in 1914, it took almost two hours to sail across the bay. Rachel Shinn ruled the boarding house with a firm hand; but she was an excellent cook and raised chickens and pigs, slaughtering them on the premises to make her popular dishes. The seaweed shanties where the workmen lived were grouped at about the spot where the house High Dune now stands, on the ocean side of the Boulevard just north of Harvey Cedars. My father remembered as a child watching the men with their pitchforks collecting the wet grass that had drifted in along the bay. They tossed it onto the waiting wagons, and the horses hauled it over the meadows where it was spread out for drying and curing until it was vermin-free. It took several weeks for the seaweed to cure. The men had to keep turning it over to be sure it was thoroughly dry. The entire area, from the Boulevard down 80th street and along Bay Terrace to the end, was open meadowland used by Kinsey as a drying field. About fourteen horses and ten men worked at the High Point station. Six dollars a scow-load was paid to baymen who brought in seaweed on their own. Seaweed was so plentiful at some locations that after clearing the beach completely, the men would return the next day to the same shore and load up their flat-bottomed scows all over again. 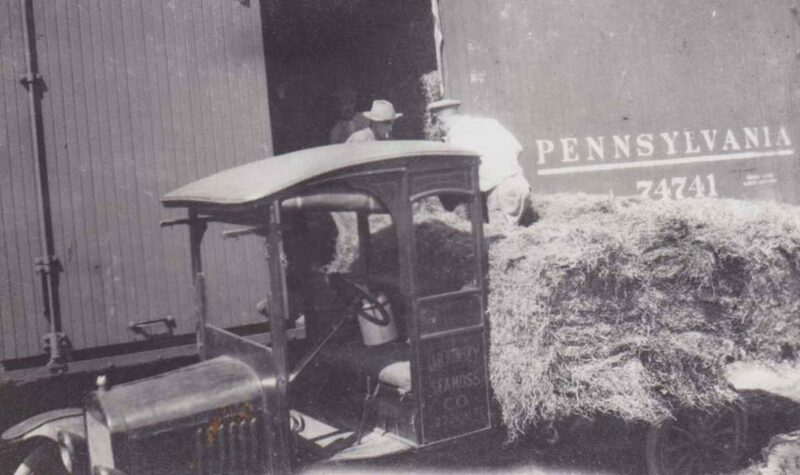 The grass was stored in the warehouses until it was baled and shipped out in boxcars. Huge baling presses filled the seaweed barns. A pole fastened to the capstan extended outside the barn and a horse was hitched to it. The animal plodded around the spindal to tighten the cable and compress the grass into bales. As the grass was pressed firmer and firmer, it got more and more difficult for the horses to wind the cable and the men from the barn would yell, “Gidyup! Gidyup!” The ubiquitous flies and mosquitoes tormented the horses as they stood in the marshy meadows. As some protection, burlap covers were thrown over the animals. But their ears and underbellies were unprotected and the poor creatures twitched their tails, their skin and their manes. When standing in the shallow water of the bay, they stomped their feet to send the spray over their bodies. From a distance, the coverings looked like the caparisoned horses of medieval knights. Men who worked for the company were paid from thirty to fifty cents an hour and worked a nine-hour day. The company sold the cured grass for eighteen to twenty dollars a ton. Thirty or forty tons of baled seaweed could be loaded into a boxcar. The railroad station at High Point was about where the borough hall stands today. At that time, train tracks ran down the center of the Island along what is now the Boulevard from Beach Haven to Barnegat Light. For a few years after the seaweed disappeared from Barnegat Bay, plus other beds in the North Atlantic, the Biological Survey Department in Washington wrote to Kinsey to inquire if any change in the growth of seaweed had been noted. It was not until the 1950s that eelgrass began to approach the earlier, healthy, levels. By then the Island had been developed along the bay front; between pollution and other human-induced insults, it never regained its original strength. Also, plastics developed during World War II provided more cost effective packing materials. The land surrounding 80th Street and Bay Terrace, where Kinsey spread his eelgrass to dry, passed to my father, and now I live there. My house is located on filled land where the grass was pulled out of the water. These days I feel lucky if I can gather enough to mulch my garden. 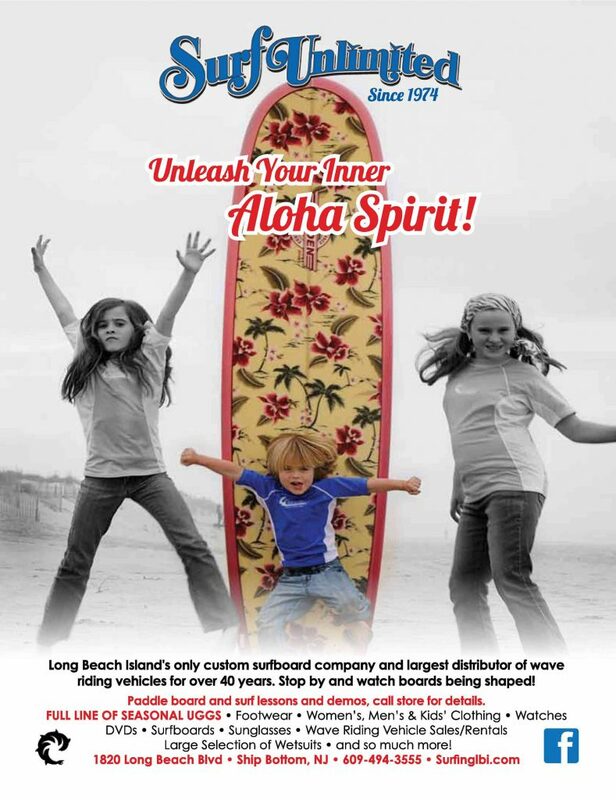 This story was excerpted from the LBI Reader: The Best of the Beachcomber, published by Down The Shore in 2015.